The online version of this article ( https://doi.org/10.1186/s12964-019-0343-5) contains supplementary material, which is available to authorized users. p21-activated kinase 1 (PAK1) is a serine/threonine protein kinase that serves as an important downstream mediator of the small Rho GTPases, including Rac1 and Cdc42, which regulates diverse cellular processes, including cell proliferation, anchorage-independent growth, cell adhesion, migration and invasion . Amount evidence has indicated that PAK1 is substantially overexpressed in various cancers, including breast cancer, hepatocellular carcinoma, pancreatic cancer, lung cancer and cutaneous T cell lymphoma [8, 9, 10, 11]. In addition, Ito et al reported that PAK1 mRNA expression is statistically associated with grade and the risk of recurrence in bladder cancers, and they also demonstrated that high PAK1 protein expression is an independent factor associated with recurrence . Consistently, by using immunohistochemistry, Carter and colleges previously showed that PAK1 is increased with progression from the adenoma to carcinoma sequence, with the most obvious increases in invasive and metastatic human colorectal carcinomas . More recently, Yang et al reported that overexpression of PAK1 correlates with aberrant expression of EMT markers and poor prognosis in non-small cell lung cancer . All these findings indicate that PAK1 may play a central role in regulating tumorigenesis and metastasis. Indeed, ectopic expression of PAK1 facilitates the migration and invasion of gastric cancer cells. 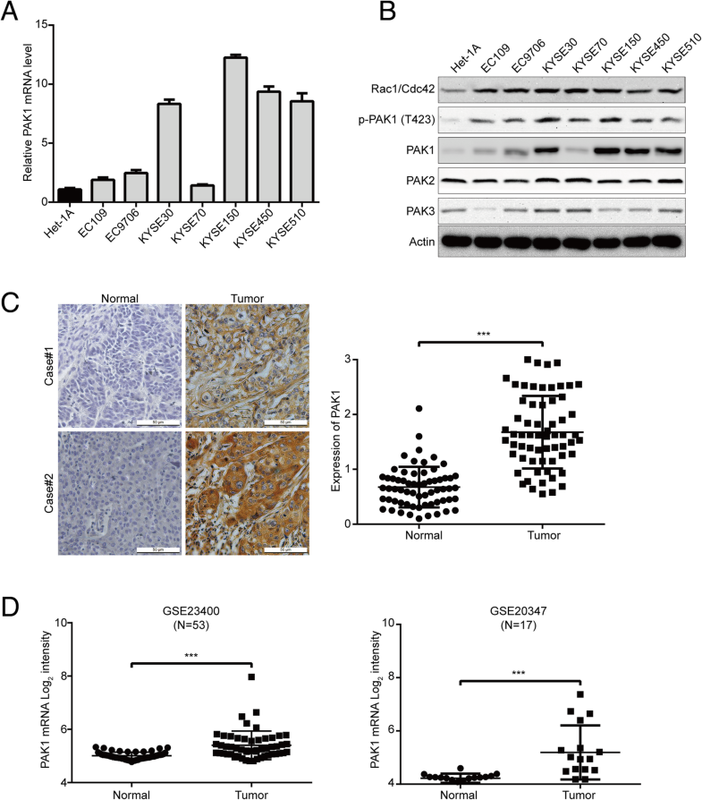 A recent study stated that PAK1 promotes epithelial–mesenchymal transition (EMT) and radio-resistance in lung cancer cells . Conversely, knockdown of PAK1 by pharmacological inhibition and using short-hairpin RNA (shRNA) can significantly in hibit human cancer cell proliferation, anchorage-independent growth, migration and invasion in vitro and reduce tumor growth and metastasis in animal models [10, 11, 16, 17, 18]. In addition, depletion of active PAK1 up-regulates the immune system of APC∆14/+ mice and suppresses intestinal tumor development . However, whether PAK1 is involved in ESCC development, progression and the underpinning molecular mechanisms remain unclear. We next explored the underlying mechanisms of how PAK1 influences the growth, migration and invasion of ESCC cells. It has been demonstrated that The Raf1/MEK1/ERK cascade plays a central role in ESCC biology [32, 33, 34], and PAK1 regulate ERK activity in some cell types by phosphorylating Raf1 at S338 and MEK1 at S298 [35, 36, 37], which suggests that the effect of PAK1 on ESCC cells involves the Raf1/MEK/ERK pathway. Intriguingly, Our results showed that ectopic expression of PAK1 in EC109 and KYSE70 cells increased the expression of p-Raf1 (S338), and its downstream targets: p-MEK1 (S298) and p-ERK1/2 (T202/Y204) (Fig. 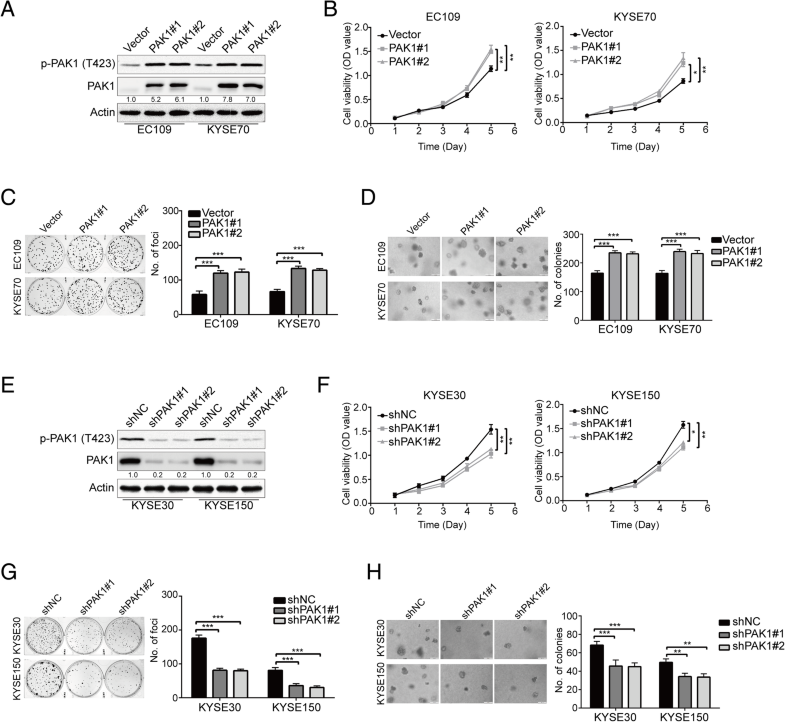 4a, Left); In contrast, PAK1 knockdown in KYSE30 and KYSE150 cells significantly decreased the protein levels of p-Raf1 (S338), as well as p-MEK1 (S298) and p-ERK1/2 (T202/Y204) (Fig. 4a, Right). It is widely believed that Raf1/MEK1/ERK signaling pathway is one of the most commonly deregulated pathways in various cancer including ESCC. 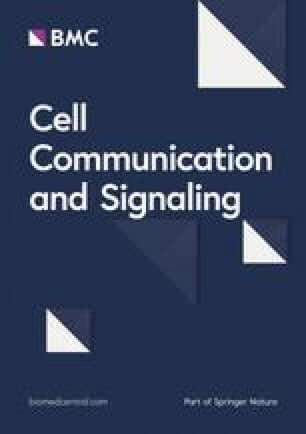 Several studies report that abnormal activation of the Raf1/MEK1/ERK signaling pathway plays an important role in promoting the growth, migration and invasion of ESCC cells [32, 33, 34]. 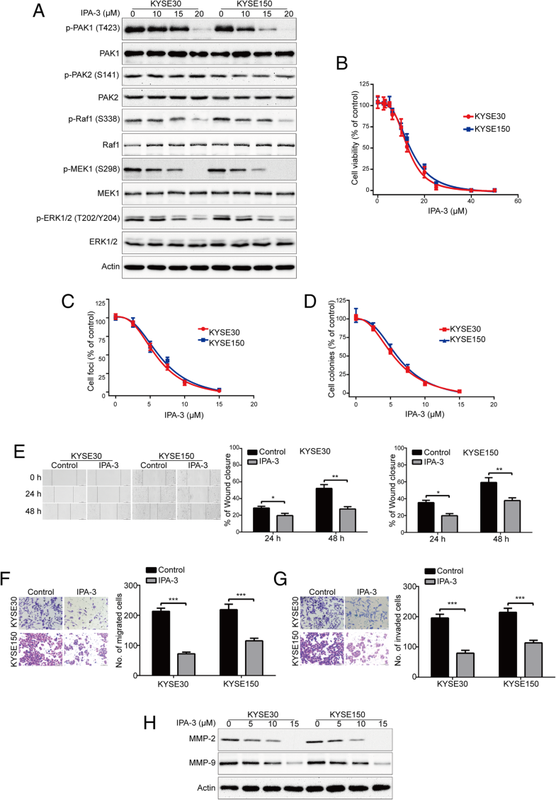 PAK1 has been demonstrated to active Raf1/MEK1/ERK pathway in some cell types by phosphorylating Raf1 on serine 338 and MEK1 on serine 298 [36, 37, 40]. However, whether targeting PAK1 suppresses ESCC cell growth and lung metastasis via inhibiting the Raf1/MEK1/ERK pathway remain largely elusive. 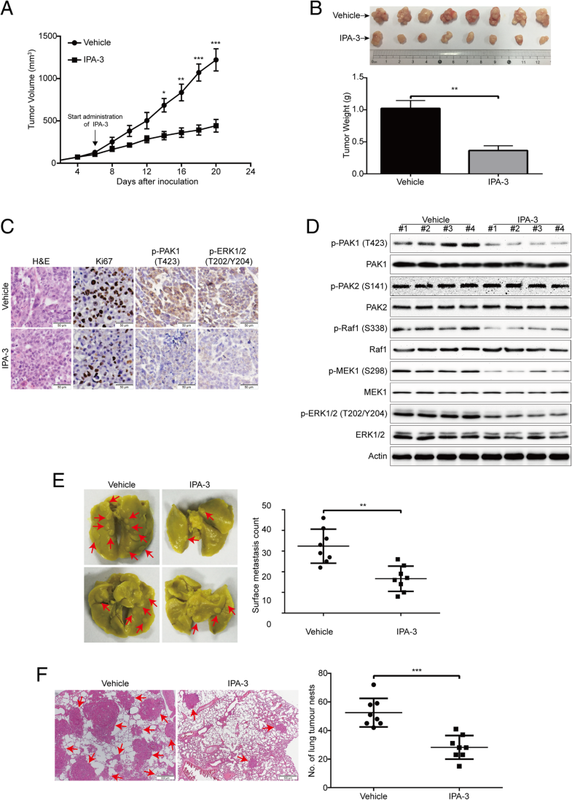 In this study, we found that ectopic expression of PAK1 in ESCC results in aberrant activation of Raf1/MEK1/ERK signaling pathway as monitored by p-Raf1 (S338), p-MEK1 (S298), p-ERK1/2 (T202/Y204). As expected, these proteins were down-regulated when PAK1 was silenced by shRNA or pharmacological inhibitor IPA-3. More importantly, we also found that enforced expression of Raf1 attenuates the inhibitory effect of IPA-3 on cell growth, colony formation, migration and invasion of ESCC cells. 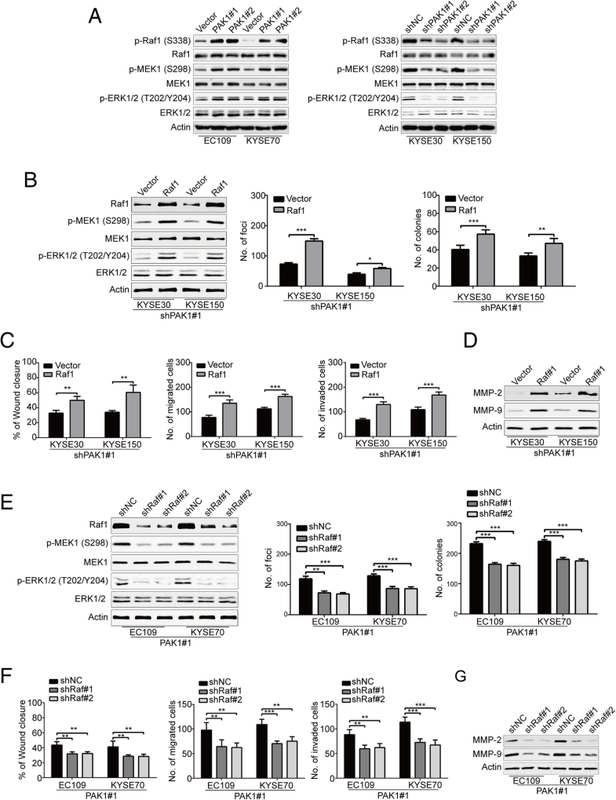 Conversely, silencing Raf1 by shRNAs or using U0126, a MEK1 specific inhibitor, dramatically abrogates the promotive effect of PAK1 on ESCC cells. 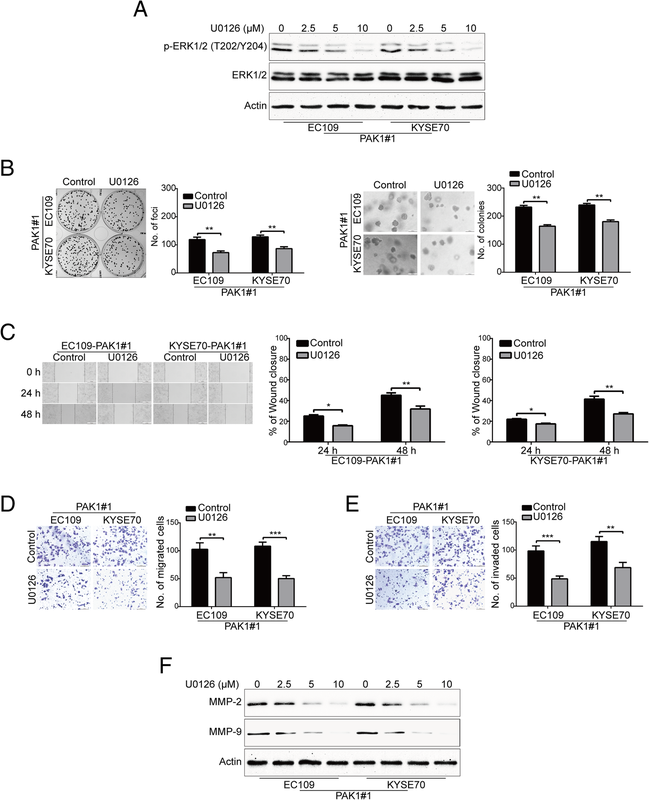 Therefore, our study demonstrates that targeting PAK1 suppresses ESCC cell growth, migration and invasion at least partly via blocking Raf1/MEK1/ERK signaling pathway. Previous reports showed that cancer cells that carry mutations in RAS and Rac1 genes are more sensitive to PAK inhibitors [49, 50]. In addition, several lines of evidences indicate that the KRAS mutation was detected in a few ESCC patients [51, 52, 53]. Although the activating mutations in RAC1 gene in ESCC has not been published to date, we and others had found Rac1 protein is consistently higher in ESCC cell lines and tissues compared with the corresponding control group . Moreover, the high expression of Rac-1 is significantly correlated with advanced tumor depth, lymph node metastasis, and shorter disease-free and survival time . In this study, we also demonstrated that targeting PAK1 by shRNA or pharmacology inhibitor IPA-3 could significantly suppress ESCC cell growth, migration, invasion and metastasis in vitro and in vivo. Therefore, targeting PAK1 may be a promising therapeutic strategy for ESCC patients, especially for those with RAS and Rac1 mutations.